Yesterdays post “Whole Brain Catalog: the Google Earth for the Brain” introduced the Whole Brain Catalog. Within the overall framework of a mouse brain hangs a lot of data. Today we’ll look at some of the data you may explore in the Whole Brain Catalog. Note: Please read yesterday’s post if you haven’t installed the Whole Brain Catalog on your computer. Brain cell data from actual microscope measurements are displayed in the Whole Brain Catalog. Let’s start by looking at brain cells (neurons). Data associated with cells of all types are listed under “Cells” in the Data Type area. Go to the Data Type area to the left-bottom of the brain viewing area and click on the arrow to the left of “Cells.” This will open the list of cell types and groups of cells available to you. Find the “Mainen-Sejnowski Pyramidal” cell and check the box to the left of the label. 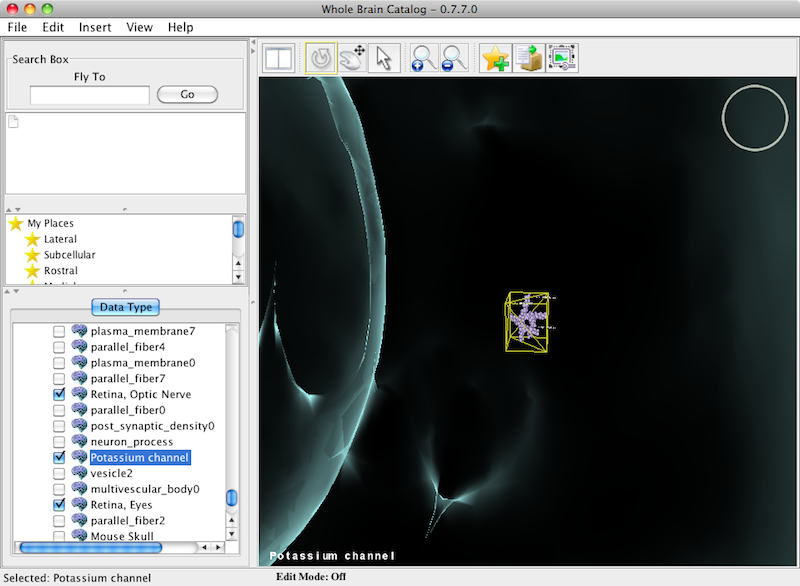 Give Whole Brain Catalog a bit of time to download the data. Once the data are loaded, double-click “Mainen-Sejnowski Pyramidal” in the Data Type area and Whole Brain Catalog will zoom through the brain and show you the pyramidal cell. 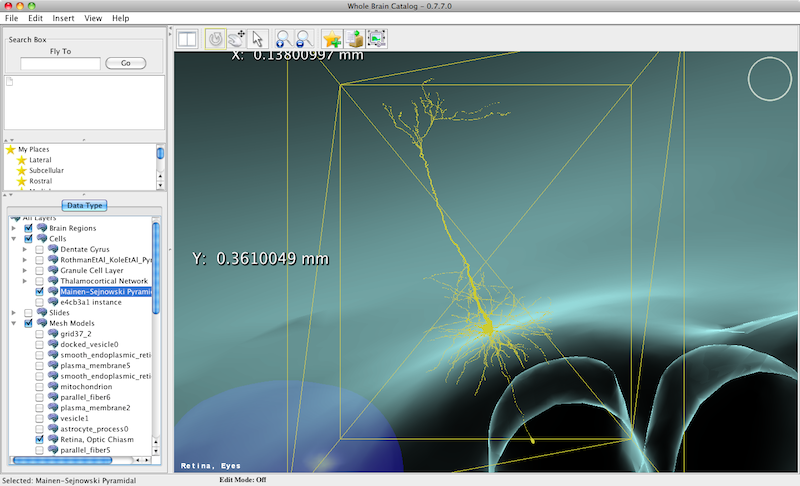 The yellow wire box surrounds the neuron. To move around the cell click the “Rotate Camera” button. You’re now at a relatively small scale so when you zoom in and out be sure to press your mouse button down just once and hold (rather than twice and hold). Would you like to place the brain back into the context of the whole mouse? Adding the skull helps me to do this. 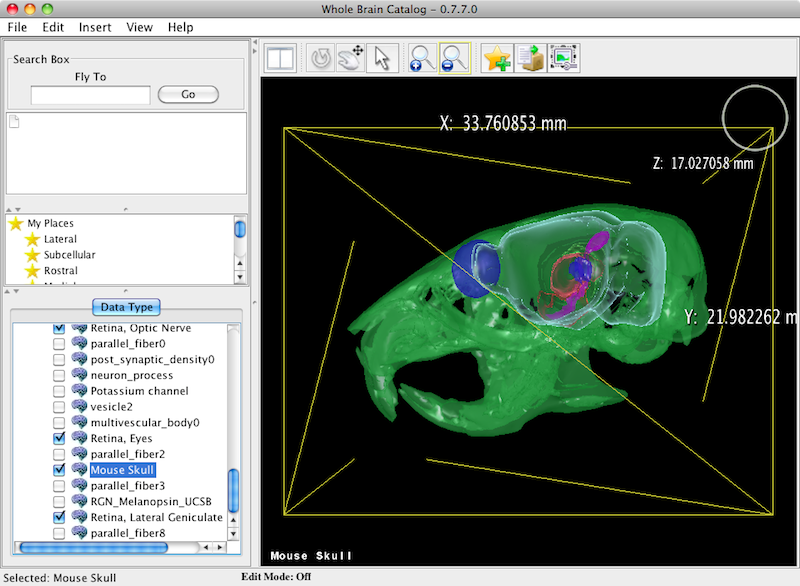 In the Data Type area expand “Mesh Models” and look for “Mouse Skull.” Check the box to the left and, after the data load, double click “Mouse Skull” to zoom out and view the skull. Tip: You may also bring up a context menu. In Windows use your right mouse button and on Macintosh computers use the command button with your mouse click. The mouse skull is displayed along with the brain in the Whole Brain Catalog. Now that we’re back at a high-level view of the mouse and its brain we’ll dive down to the very small molecular level and look at a protein molecule. The Whole Brain Catalog displays three dimensional molecular structure data from the Protein Data Bank. Go to the Data Type area and click on the arrow to the right of “Mesh Models.” Use the scroll bar to the right of the Data Type area to scroll down until you see “Potassium channel.” Check the box to the left of “Potassium channel” and give Whole Brain Catalog a bit of time to download the data. The potassium channel is displayed in the Whole Brain Catalog. Double-click “Potassium channel” in the Data Type area and Whole Brain Catalog will zoom through the brain and show you the potassium channel. The yellow wire box surrounding the potassium channel is very small in this standard view. Select the “Zoom In” button and press your mouse button down and hold to get closer. We’re at such a small scale that this slower zoom seems fast. You may find yourself zooming past the molecule. Quick clicks using both “Zoom In” and “Zoom Out” should get you there. Be sure to admire the structure of this molecule by using the “Rotate Camera” button. This entry was posted in Brain Science and tagged Brain Science, Open Data Repositories, Semantic Web on October 27, 2010 by Donald Doherty.